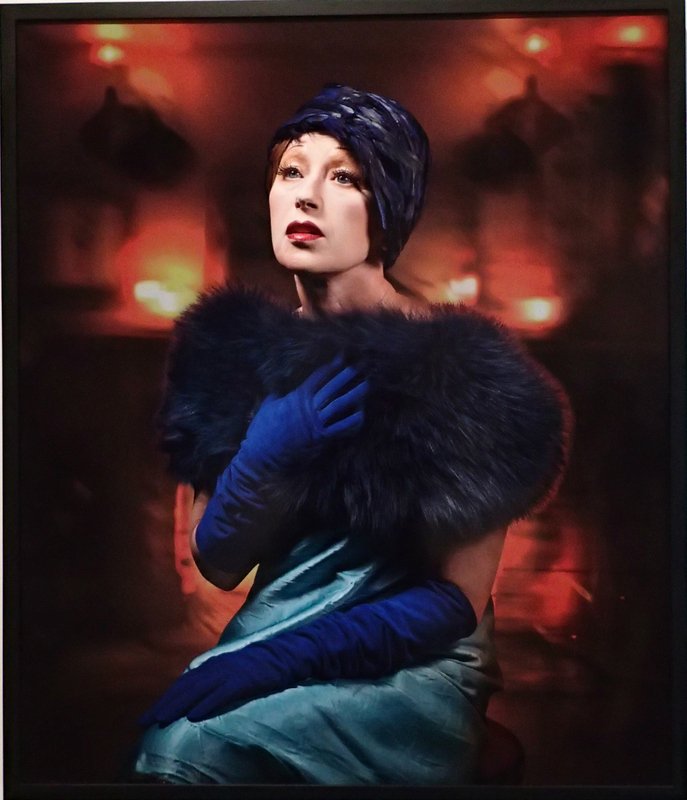 Who is the artist Cindy Sherman? Would she please step forward? For me, this is the provocative question when approaching her artwork. For forty years she has created some of the most telling and persuasive artworks of our time. By photographing herself, something she excels at doing, and generally working alone, Sherman has portrayed a vast and complex array of characters. But what is she really trying to express to us through these diverse personality types she is creating? What’s the moral to the story when viewing her artwork? What can we tell through her elaborate and extraordinary photographic self- portraits? Is this a woman who is baring her soul to us? Or is she merely entertaining us through the diverse characters she self-creates and then documents by using the rich medium of photography? Can we pick up any clues by engaging with her substantial body of artwork? Maybe yes, maybe no. 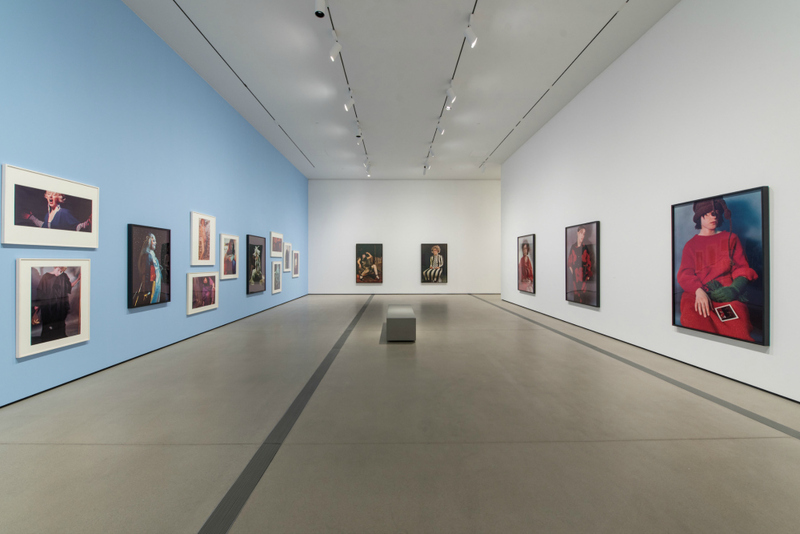 But we certainly can explore the question in depth by attending the current impressive retrospective “Cindy Sherman: Imitation of Life” at the Broad museum in Downtown Los Angeles. The Broad’s first-floor galleries display over 120 of her works, drawn primarily from the Broad’s collection with additional key loans from other institutions. Eli and Edye Broad first started collecting Sherman’s work in November 1982. At the time, the Broads were not collecting fine art photography per say. They loved her work, which they viewed as documents of performance as much as photographic objects. 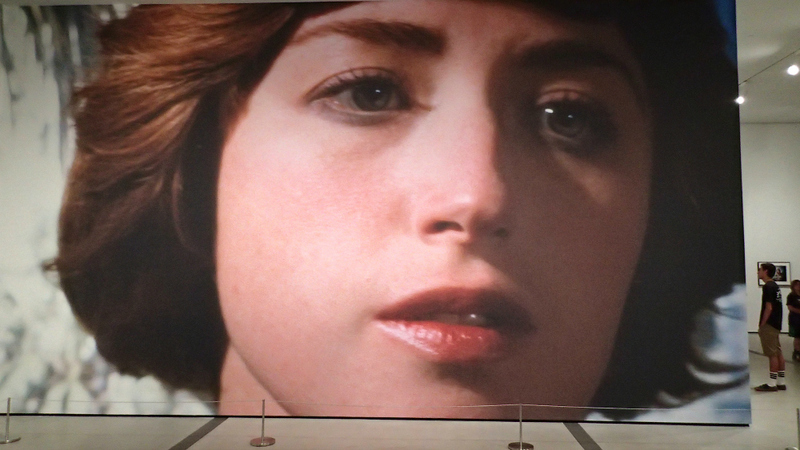 Represented in great depth, Cindy Sherman became their most collected artist. She is the only artist to be followed by the Broads so assiduously for so many decades. “Imitation of Life” is the first special exhibition to be held at the Broad museum. The collection is a display of their significant commitment to this artist and her substantial body of work. We know she’s a conceptual artist, who uses the medium of photography. She’s not a photographer in the sense that Josef Koudelka, Edward Weston or Cartier-Bresson are regarded as photographers. She doesn’t use the camera to explore her vision of our world, shooting portraits of people the way Diane Arbus did or Annie Leibowitz does today. She has made a career of photographing herself, by masquerading as different character’s, each one wearing an elaborate costume, with a matching hairdo that goes with it, complimented with just the right amount of make-up, that she brilliantly applies herself. She often designs the costumes she wears, literally creating the costumes by sewing together her own inventory of fabrics and outfits she finds at flea markets and Good Will stores. She includes props to support the character’s authenticity. It’s as though she has cast herself in her own role, that of a silent actress, acting out for the still camera-expressing facially her sense of melancholy, fear, or sexuality. And she has courageously delved into issues of feminism through her work, something that is abundantly clear when experiencing the Broad exhibit first hand. Born January 19, 1954 in Glenn Ridge New Jersey, Sherman is a highly accomplished, celebrated and internationally known artist. Her works have sold for substantial amounts of money. In 2011, at Christie’s, the revered New York auction house, her untitled #96 (shot in 1981) sold for a record breaking 3.9 million dollars. In 1995 she was the recipient of a MacArthur fellowship. She became interested in the visual arts studying at Buffalo State College, N.Y. Originally she was a painter; but, later felt photography offered her opportunities that painting was limited in. She was frustrated with painting. Interestingly; now she is the canvas upon which she paints her own self-portrait. Her photographs have a “painterly” quality, especially how they are structured and how she composes herself in the picture. They have a classic resemblance to portraits of aristocracy or street commoner’s majestically painted by Francisco Goya. She has explored this conceptual idea of shooting these self-portraits, self-assemblages or “selfies” (call them what you like) for a major part of her life. She began playing “dress-up” early on. The perplexing question, however (at least as I see it), is- are we connecting to a woman who is revealing her core to us? Or is Cindy Sherman simply entertaining us through her amazing execution of these personas, her narcissistic venture created and then photographed? My suspicion is that she is working from a genuinely deep place and many of these characters are, in a way, definitive of her psyche, and clues to who she is. I believe she is taking emotional chances with the characters she examines, and we are witnessing an artist who is on a self-explorative journey, and we are all the better for it. When shooting these self- portraits and for the record (she doesn’t describe them as self-portraits or see them that way), even though they are photographs she takes of herself, she uses sophisticated and professional photographic equipment. Her technique as a photographer is quite admirable. Her sense of lighting, exposure, framing and the printing of her photographs are all of a very high standard. She knows how to process film, having spent many years in the darkroom developing her own negatives and making prints. From its inception, the art of photography has excelled in portraiture, like no other medium. It has the ability to reveal the soul, to capture someone’s essence, at least for a precise moment – and then to immortalize it. The photograph provides a tremendous amount of information by revealing the subjects bone structure, body language, facial features, clothing, and the location of the portrait. But it also provides a fiercely sensitive and subjective way to interpret the likeness of that person. What is the implication of the portrait? Is this a person of high society, or an individual from the working class? One can think of all the great portrait photographers, like August Sander, Julia Margret Cameron, Edward Steichen, Richard Avedon, Arnold Neuman, Irving Penn, and even Matthew Brady who shot the great portraits of President Lincoln, as shining examples of photographers who understood this. Sherman is messing with this idea, challenging us to re-evaluate what a photographic portrait can be. 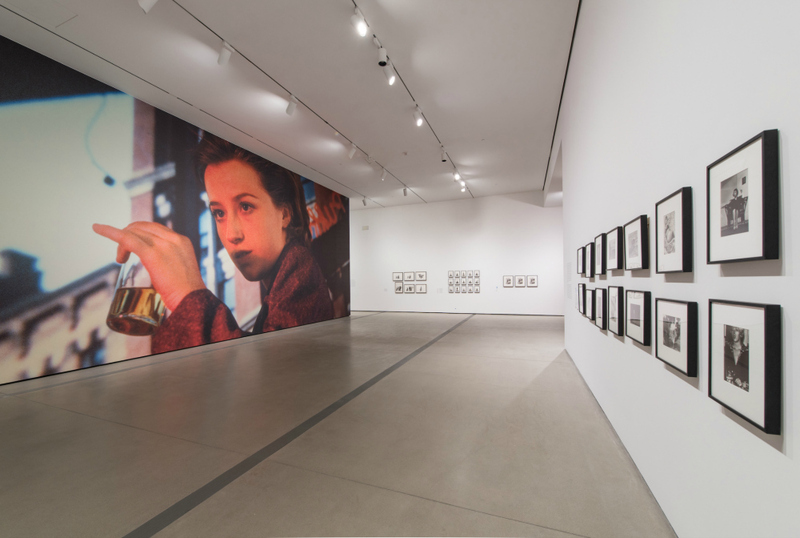 The Broad exhibition is comprehensive and detailed in its representation of the many different themes Cindy Sherman has explored in her self-documentation. Her Untitled Film Stills, a series of black–and-white photographs that she created between 1977 and 1980 is considered by many to be one of the most original and influential accomplishments in the contemporary art world. Clever, challenging and suggestive this lively catalog of female roles touches a vital nerve in our culture. Sherman readily credits the powerful influence movies have had on her artwork. European actresses like Brigitte Bardot, Jeanne Moreau, and Simone Signoret have had a strong impression on her. Sherman plays and stages all the roles herself. Her 1985-1989 collection “Disasters and Fairy Tales” signified a shift in Sherman’s work as she explored other genres including fairy tales, historical portraits and horror movies. This was also notable because it was the end of the era of using her own body as the sole subject of her portraits as she began to focus more on anatomical models and dolls. In “Disasters and Fairy Tales” she used a wide spectrum of make-up techniques, masks and prostheses. From medical supply houses, she purchased precise models of vaginas, breasts, skullcaps, organs, and limbs, forming a shocking and grotesque representation of the human body. Sherman then photographed them in different positions. Employing high-resolution camera equipment, she prepared large detailed color prints (50×72 inches) of the macabre and disturbing images. They are dark and courageous, and an entire gallery is dedicated to these photographs. 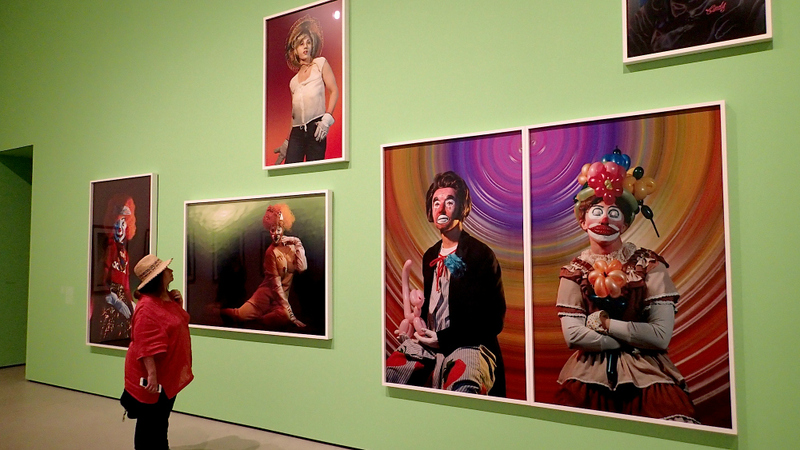 Also in the exhibit, her clown series photographs occupy a very large wall. In the series, she poses as a pathetic, sad, or gleeful clown. These are digitally manipulated backgrounds; against which she probes the bizarre extremes of the clown. Photographed in a style reminiscent of glamor headshots, and using intensely colored backgrounds, the images have a surreal quality. Focusing on her face, they visually scream out, playing with the idea of rage. It is the dark-side of the clown, the murderous clown, and the images are visually absurd in their gross and exaggerated color executions. Regardless, I think she must have had fun creating these photographs. Humor nonetheless persists in these clown portraits by celebrating the stereotypical circus clown as a relic of our childhood memories. From her spirited and transformational black-and-white “untitled Film Stills” in the 1970’s, to her recent series on suburban American housewives, middle-American “everywoman” or female types trying frantically to look “wealthy and cultured”, (and failing miserably), Cindy Sherman has shown herself to be the preeminent master of self- morphing, utilizing everything from prosthetics and old fashioned make-up techniques, to digital technology. She conceives and portrays extraordinary alter egos and copious identities that vividly reflect our image-drenched, media-suffocating culture. In the process, she has created her own genre. 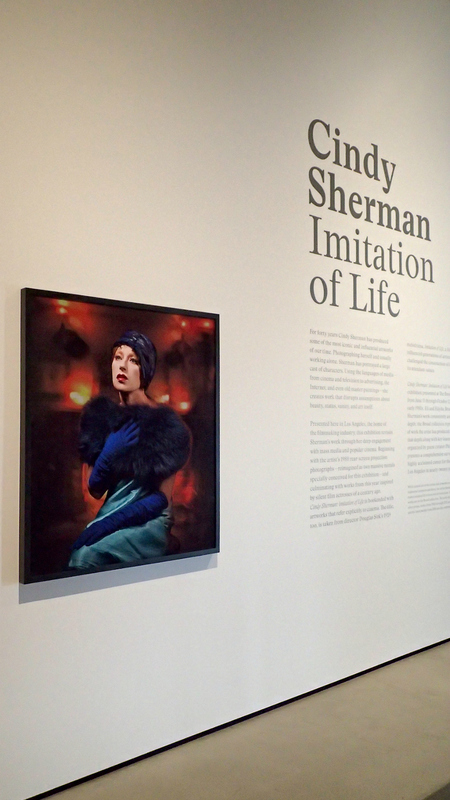 If you wish to learn more about her, by engaging directly with this complex artist, the Broad Museum’s in-depth retrospective; Cindy Sherman “Imitation of Life” is an excellent opportunity. A native of Los Angeles, Anthony Friedkin began photographing as a child. He started working in the darkroom at age eleven, processing and printing his own images. Since that time, which was in the early 1960's, he has accomplished a significant body of work. His photographs are included in major Museum collections: New York's Museum of Modern Art, The J. Paul Getty Museum and others. He is represented in numerous private collections as well. 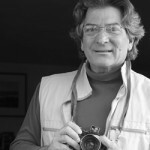 His pictures have been published in Japan, Russia, Europe, and many Fine Art magazines in America.